1.1 For purposes of this Agreement, a “User” is any person who accesses the Site for whatever purpose, regardless of whether said User has registered with Mingtiandi as a registered User or whether said User is a paying customer for a specific service provided by Mingtiandi. A User includes the person using this Site and any legal entity which may be represented by such person under actual or apparent authority. 1.3 This Agreement applies to each Premium Service (as defined below) in addition to any terms and conditions that may be applicable to such specific Premium Service provided, however, that (a)in the event of any conflict or inconsistency between any provision of the terms and conditions that may be applicable to such Premium Service and any provision of this Agreement, such conflict or inconsistency shall (except as otherwise expressly provided or agreed) be resolved in a manner favorable to Mingtiandi and/or its affiliates; and (b) only to the extent that such conflict or inconsistency cannot be so resolved, the provisions of the terms and conditions applicable to such specific Premium Service shall prevail. 1.4 Mingtiandi may amend this Agreement at any time by posting the amended and restated Agreement on the Site. The amended and restated Agreement shall be effective immediately upon posting. This Agreement was last amended at the date listed below. Posting by Mingtiandi of the amended and restated Agreement and your continued use of the Siteshall be deemed to be acceptance of the amended terms. This Agreement may not otherwise be modified, except in writing by an authorized officer of Mingtiandi. 2.1 Access to the Site and certain of its features are provided to all Users free of charge. However, Mingtiandi reserves the right, without prior notice, to restrict access to certain areas or features of the Site (“Premium Services”) to paying Users or Users who undergo a specific registration process. Access to and use of these Premium Services are governed by additional terms and conditions under separate agreements in addition to this Agreement. 2.2 Mingtiandi reserves the right to deny Premium Services to any User for whatever reason in order to protect the interests of Mingtiandi. 3.1 Users may use this Site solely for their own personal or internal purposes. Each User agrees that it shall not copy, reproduce or download any information, text, images, video clips, directories, files, databases or listings available on or through the Site (the “Mingtiandi Content”) for the purpose of re-selling or re-distributing the Mingtiandi Content, mass mailing (via emails, wireless text messages, physical mail or otherwise), operating a business that competes with Mingtiandi, or otherwise commercially exploiting the Mingtiandi Content. Systematic retrieval of Mingtiandi Content from this Site to create or compile, directly or indirectly, a collection, compilation, database or directory (whether through robots, spiders, automatic devices or manual processes) without written permission from Mingtiandi is prohibited. In addition, use of the content or materials for any purpose not expressly permitted in this Agreement is prohibited. 3.2 Some of the Mingtiandi Content displayed on this Site is provided or posted by third parties (“Third Party Content”). Mingtiandi is not the author of third-party content, whether contributed by anonymous users or paid content providers. Neither Mingtiandi nor any of our affiliates, directors, officers or employees has entered into any sales agency relationship with such third party by virtue of our display of the Third Party Content on the Site. Any Third Party Content is the sole responsibility of the party who provided the content. Mingtiandi is not responsible for the accuracy, propriety, lawfulness or truthfulness of any Third Party Content, and shall not be liable to any User in connection with such User’s reliance of such Third Party Content. In addition, Mingtiandi is not responsible for the conduct of any User’s activities on the Site, and shall not be liable to any person in connection with any damage suffered by any person as a result of such User’s conduct. 3.3 Mingtiandi may allow Users access to content, property or related services offered by third parties through hyperlinks (in the form of word link, banners, channels or otherwise) to such Third Party’s web site. You are cautioned to read such sites’ terms and conditions and/or privacy policies before using such sites in order to be aware of the terms and conditions of your use of such sites. User acknowledges that Mingtiandi has no control over such third party’s web site, does not monitor such sites, and Mingtiandi shall not be responsible or liable to anyone for such web site, or any content, property or related services made available on such a website. 3.4 Messages or information sent by a User through communication systems provided by the Site, or through emails, fax or letters to addressees obtained from the Site, shall not contain any of the materials described in the provisions of Section 4.5 below. 3.5 Mingtiandi reserves the right to limit, deny or create different access to the Site and its features with respect to different Users, or to change any of the features or introduce new features without prior notice. Each User acknowledges that inability to use the Site wholly or partially for whatever reason may have adverse effects on its business. Each User hereby agrees that in no event shall Mingtiandi be liable to the User or any third parties for any inability to use the Site (whether due to disruption, limited access, changes to or termination of any features on the Site or otherwise), any delays, errors or omissions with respect to any communications or transmission, or any damage (direct, indirect, consequential or otherwise) arising from the use of or inability to use the Site or any of its features. 3.6 No User shall undertake any scheme to undermine the integrity of the computer systems or networks used by Mingtiandi and/or any other User and no User shall attempt to gain unauthorized access to such computer systems or networks. 3.8 As a condition of your access to and use of Mingtiandi, you agree that you will not use the Mingtiandi.com service to infringe the intellectual property rights of others in any way. Mingtiandi will in appropriate circumstances terminate the accounts of members or users who are repeat infringers of the copyrights, or other intellectual property rights, of others. In addition, Mingtiandi.com reserves the right to terminate the account of a user upon any single infringement of the rights of others in conjunction with use of the Mingtiandi service, or if Mingtiandi believes that user conduct is harmful to the interests of Mingtiandi, its affiliates, or other users, or for any other reason in Mingtiandi’s sole discretion, with or without cause. 4.1 Each User who has filled out an on-line registration form on the Site by giving its information (such as name, address, telephone and fax number, email address, details of its business, etc.) 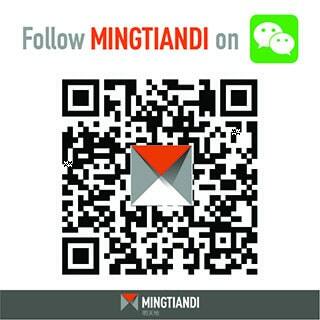 is a registered user of Mingtiandi.com (a “Registered User”). Mingtiandi.com will establish an account (“Account”) for each Registered User and each Registered User will be assigned a user alias (“User ID”) and password (“Password”) for log-in access to its own Account. 4.2 Mingtiandi may assign a web-based email account with limited storage space for the User to send or receive email (the “Email Account”). The User shall be responsible for all users and the content of all the messages communicated through the Email Account, as well as the consequences of any such message. 4.3 If the Registered User is a business entity, you represent that (a) you have the authority to bind the entity to this Agreement; (b) the address you use when registering is the principal place of business of such business entity; and (c) all other information submitted to Mingtiandi.com during the registration process is true, accurate, current and complete. For purposes of this provision, a branch or representative office will not be considered a separate entity and its principal place of business will be deemed to be that of its head office. 4.4 By becoming a Registered User, you consent to the inclusion of your personal data in our Mingtiandi Database and authorize Mingtiandi to share such information with other Users. 4.5 Mingtiandi may suspend or terminate a Registered User’s Account or Email Account at any time by giving no less than 24-hour notice to the Registered User; provided, however, that notice is not required for such termination if (a) in Mingtiandi’s determination, there is any breach of the provisions of this Agreement by the Registered User; or (b) Mingtiandi has reasonable grounds to suspect that such information provided by a Registered User is untrue, inaccurate or is not current or complete, or (c) Mingtiandi believes that the Registered User’s actions may cause financial loss or legal liability to such Registered User, Mingtiandi’s other Users, or Mingtiandi or its affiliates. 4.7 A Registered User may not sell, attempt to sell, offer to sell, give, assign or otherwise transfer an Account, User ID or Password to a third party without the prior written consent of Mingtiandi. Mingtiandi may suspend or terminate the Account of a Registered User or the transferee of a Registered User in the event of a sale, offer to sell, gift, assignment or transfer in violation of this Section. 4.8 Notwithstanding Section 5.1 above, Mingtiandi may refuse registration and deny the issuance of an Account and/or Email Account and associated User ID and Password to any User for whatever reason. 5.2 No sales agency relationship is created between any User and Mingtiandi, our affiliates, directors, officers or employees by virtue of Mingtiandi’s display of any of the User’s information on the Site. b. maintain and promptly amend all information to keep it true, accurate, current and complete. Each User hereby grants an irrevocable, perpetual, worldwide and royalty-free, sublicensable (through multiple tiers) license to Mingtiandi to display and use all information provided by such User in accordance with the purposes set forth in this Agreement and to exercise the copyright, publicity, and database rights you have in such material or information, in any media now known or not currently known. 5.4 Each User hereby represents, warrants and agrees that it has obtained all necessary third party copyright, trademark, trade secret right or patent licenses and permissions, or such other licenses or permissions as may be required in connection with any other personal or proprietary rights of any third party (including but not limited to rights of personality and rights of privacy), for any material or information it posts on the Site or provides to Mingtiandi or authorizes Mingtiandi to display. Third party copyrights, trademarks, trade secret rights, patents and other personal or proprietary rights affecting or relating to material or information displayed on the Site, including but not limited to rights of personality and rights of privacy, or affecting or relating to products that are offered or displayed on the Site, are hereafter referred to as “Third Party Rights.” Each User hereby represents, warrants and agrees that it shall be solely responsible for ensuring that any material or information it posts on the Site or provides to Mingtiandi or authorizes Mingtiandi to display does not, and that the products represented thereby do not, violate any Third Party Rights, or is posted with the permission of the owner(s) of such rights. Each User hereby represents, warrants and agrees that it has the right to offer and sell the properties and all services it offers and displays on the Site, and that such offer and sale of those properties and services violates no Third Party Rights. l. otherwise create any liability for Mingtiandi or its affiliates. 5.6 Mingtiandi reserves the right in its sole discretion to remove any material displayed on the Site which it reasonably believes is unlawful, could subject Mingtiandi to liability, violates this Agreement or is otherwise found inappropriate in Mingtiandi’s opinion. Mingtiandi reserves the right to cooperate fully with governmental authorities, private investigators and/or injured third parties in the investigation of any suspected criminal or civil wrongdoing. Furthermore, Mingtiandi may disclose the User’s identity and contact information, if requested by a government or law enforcement body, an injured third party, or as a result of a subpoena or other legal action, and Mingtiandi shall not be liable for damages or results thereof and User agrees not to bring any action or claim against Mingtiandi for such disclosure. In connection with any of the foregoing, Mingtiandi may suspend or terminate the Account of any User as Mingtiandi deems appropriate in its sole discretion. User agrees that Mingtiandi shall have no liability to User, including no liability for consequential or any other damages, in the event Mingtiandi takes any of the actions mentioned in this Section, and that User agrees to bear the risk that Mingtiandi may take such actions. 6.1 THE FEATURES AND SERVICES ON THE Mingtiandi.com SITE ARE PROVIDED ON AN “AS IS” AND “AS AVAILABLE” BASIS, AND Mingtiandi HEREBY EXPRESSLY DISCLAIMS ANY AND ALL WARRANTIES, EXPRESS OR IMPLIED, INCLUDING BUT NOT LIMITED TO ANY WARRANTIES OF CONDITION, QUALITY, DURABILITY, PERFORMANCE, ACCURACY, RELIABILITY, MERCHANTABILITY OR FITNESS FOR A PARTICULAR PURPOSE. ALL SUCH WARRANTIES, REPRESENTATIONS, CONDITIONS, UNDERTAKINGS AND TERMS ARE HEREBY EXCLUDED. 6.2 Mingtiandi MAKES NO REPRESENTATIONS OR WARRANTIES ABOUT THE VALIDITY, ACCURACY, CORRECTNESS, RELIABILITY, QUALITY, STABILITY, COMPLETENESS OR CURRENTNESS OF ANY INFORMATION PROVIDED ON OR THROUGH THE SITE. Mingtiandi DOES NOT REPRESENT OR WARRANTY ANY OFFER, DISPLAY, PURCHASE, SALE AND/OR USE OF INDUSTRIAL PROPERTY OR RELATED SERVICES OFFERED OR DISPLAYED ON THE SITE DOES NOT VIOLATE ANY THIRD PARTY RIGHTS; AND Mingtiandi MAKES NO REPRESENTATIONS OR WARRANTIES OF ANY KIND CONCERNING ANY PRODUCT OR SERVICE OFFERED OR DISPLAYED ON THE Mingtiandi.com SITE. 6.3 Any material downloaded or otherwise obtained through the Site is done at each User’s sole discretion and risk and each User is solely responsible for any damage to its computer system or loss of data that may result from the download of any such material. No advice or information, whether oral or written, obtained by any User from Mingtiandi or through or from the Site shall create any warranty not expressly stated herein. 6.4 Under no circumstances shall Mingtiandi be held liable for an delay or failure or disruption of the content or services delivered through the Site resulting directly or indirectly from acts of nature, forces or causes beyond its reasonable control, including without limitation, Internet failures, computer, telecommunications or any other equipment failures, electrical power failures, strikes, labor disputes, riots, insurrections, civil disturbances, shortages of labor or materials, fires, flood, storms, explosions, Acts of God, war,governmental actions, orders of domestic or foreign courts or tribunal or non-performance of third parties. 6.5 Each User hereby agrees to indemnify and save Mingtiandi, its affiliates, directors, officers and employees harmless, from any and all losses, claims, liabilities (including legal costs on a full indemnity basis) which may arise from such User’s use of the Site (including but not limited to the display of such User’s information on the Site) or from its breach of any of the terms and conditions of this Agreement. Each User hereby further agrees to indemnify and save Mingtiandi, its affiliates, directors, officers and employees harmless, from any and all losses, claims, liabilities (including legal costs on a full indemnity basis) which may arise from User’s breach of any representations and warranties made by the User to Mingtiandi, including but not limited to those set forth in Sections 6.3, 6.4 and 5.5 above. Each User hereby further agrees to indemnify and save Mingtiandi, its affiliates, directors, officers and employees harmless, from any and all losses, claims, liabilities (including legal costs on a full indemnity basis) which may arise, directly or indirectly, as a result of any claims asserted by Third Party Rights claimants or other third parties relating to products offered or displayed on the Site. Each User hereby further agrees that Mingtiandi is not responsible and shall have no liability to it, for any material posted by others, including defamatory, offensive or illicit material and that the risk of damages from such material rests entirely with each User. Mingtiandi reserves the right, at its own expense, to assume the exclusive defense and control of any matter otherwise subject to indemnification by you, in which event you shall cooperate with Mingtiandi in asserting any available defenses. Mingtiandi prohibits the use of our system or its tools to generate or send unsolicited commercial email (spam). Customers may not use the Email The Broker, Email a Friend service or other email services that Mingtiandi offers to send spam (i.e. unsolicited commercial email) or otherwise send content that would violate these Terms and Conditions. Mingtiandi has the right to revoke the privileges of any customer or company that breaches these terms. 8.1 Mingtiandi is the sole owner or lawful licensee of all the rights to the Site and the Mingtiandi Content. The Site and Mingtiandi Content embody trade secrets and intellectual property rights protected under worldwide copyright and other laws. All title, ownership and intellectual property rights in the Site and Mingtiandi Content shall remain with Mingtiandi, its affiliates or licensors of the Mingtiandi Content, as the case may be. All rights not otherwise claimed under this Agreement or by Mingtiandi are hereby reserved. 8.2 “Mingtiandi,” “Mingtiandi.com,” and related icons and logos are registered trademarks or trademarks or service marks of China Advertising Media Ltd in various jurisdictions and are protected under applicable copyright, trademark and other proprietary rights laws. The unauthorized copying, modification, use or publication of these marks is strictly prohibited. 9.1 All notices or demands to or upon Mingtiandi shall be effective if in writing and shall be duly made when sent to Mingtiandi in the following manner: to Mingtiandi Website Technology (Shanghai) Co Ltd, Building 5, Unit 112, Lane 314 Tongren Lu, Shanghai, China, Attn: Legal Department. b. immediately upon Mingtiandi’s posting such notice on an area of the Site that is publicly accessible without charge. 10.2 Mingtiandi and the User are independent contractors, and no agency, partnership, joint venture, employee-employer or franchiser-franchisee relationship is intended or created by this Agreement. 10.5 Mingtiandi’s failure to enforce any right or failure to act with respect to any breach by a User under these terms and conditions will not waive that right nor waives Mingtiandi’s right to act with respect with subsequent or similar breaches. 10.6 Mingtiandi shall have the right to assign its obligations and duties in this Agreement and in any agreement relating to Premium Services to any person or entity. This Agreement shall be governed by the laws of the Hong Kong Special Administrative Region(“Hong Kong”) without regard to its conflict of law provisions. The parties to this Agreement hereby submit to the exclusive jurisdiction of the courts of Hong Kong.